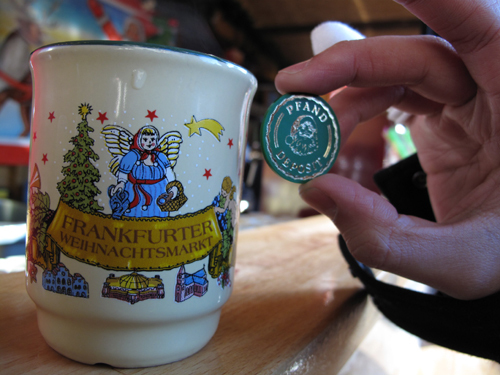 With Christmas just round the corner, it was that time of the year again to quell the Bratwurst and Gluhwein cravings. Why Birmingham you ask? – well… last minute Eurostar tickets to the continent were a rip-off as usual. Even trains up to Manchester were pretty expensive (p.s. definitely worth the trip up north if you haven’t had a chance to visit the Mancunian annual X’mas markets). With Birmingham boasting one of the most authentic markets outside of Germany or Austria and Virgin offering train fares as low as £15 return it seemed to fit the bill for a day-trip Christmas market getaway. Despite the 100+ wooden prop-up stalls sprawled across New Street and Victoria Square in the heart of the city, majority sold arts, crafts and sweets only. We were slightly disappointed to find only about 10 or so which served real food you could really sink your teeth into. Though variety was a little limited, what was on offer was pretty decent. 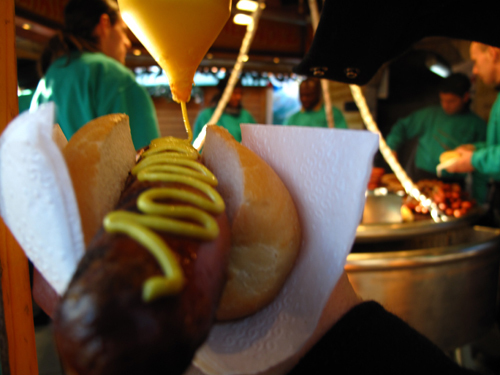 Bratwursts were delicious… juicy and succulent with its characteristic smoky-charred barbequed flavour… yummy when loaded up with sweet mustard and ketchup, dispensed from huge tankards with squeezy tubes. 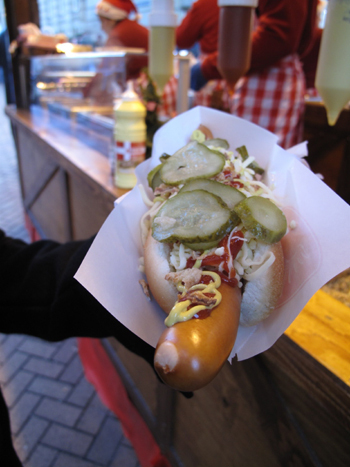 Frankfurters were also up to scratch, served with the usual holy trinity of cheese, gherkins and deep-fried garlic. 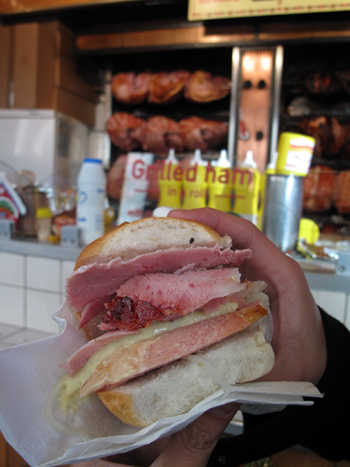 What I enjoyed most though was the spit-roast ham. Seasoned beautifully with warm spices and a sweet honey glaze, it was stuffed into a rustic white bap with home made mayonnaise and a sauerkraut-like slaw… real comfort food for the blisteringly cold weather. We enjoyed ours snuggled up right in front of the cozy warmth of the many legs of ham which were grilling away. There was a monopoly of the 5 or so watering holes round the market which was a shame as it meant that the selection of Gluhweins were very limited. The only one we had was flat and bitter. Far too much tannin and too little fruit.…a far cry from those we had in Manchester last year where there were various brewers, and an entire spectrum or delicious flavours from blueberry to raspberry. The real revelation however was in fact not German or Austrian. Trust good ol British Winter Pimm’s to save the day. If you are like me and have only enjoyed its more popular, gin-based summer sister with lemonade, the winter version (cup No.3) is brandy-based which gives it a warmth and depth of flavour that is perfect with hot, mulled apple juice. A serious cozy-me-up drink for the freezing weather and one that’s going straight to the top of the Christmas Eve party cocktail list. 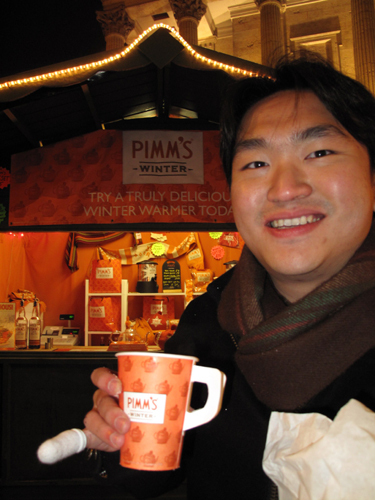 Pimm’s Winter Cup No. 3! Oh how I’m looking forward to the real festivities and over-eating already. Happy Christmas to all and have a lovely break! what’s that on your finger guan?? May: I fell a couple weeks ago =( while i was out running in the evening (was a bit dark).Lets just say it wasn’t a graceful fall and my mighty pinky broke the fall of all 70 kilos of me. Was pretty swollen for a while… Contrary to what many people have been teasing, it was NOT alcohol related.